Lucy Nicholson/ReutersVirgin Galactic’s new spaceship N202VG, which the company began building 2 and a half years ago, is seen in a hangar at Mojave Air and Space Port in Mojave, California November 4, 2014. 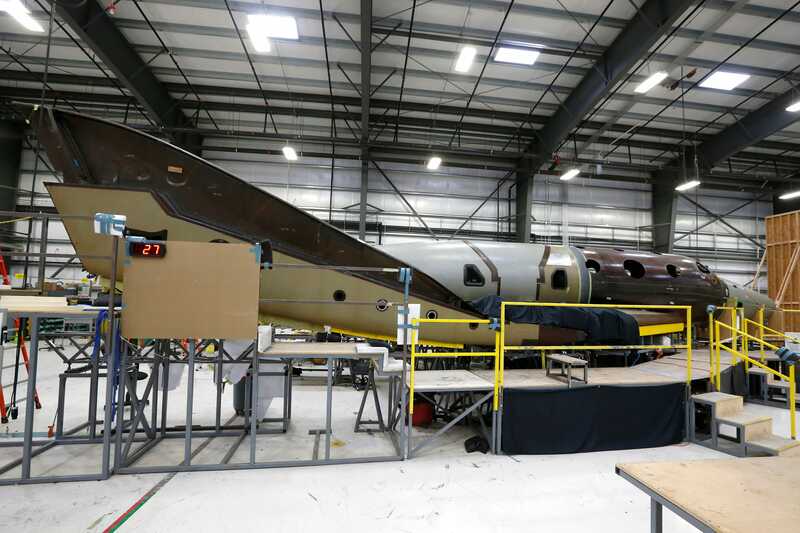 The hangar that housed Virgin Galactic’s ill-fated SpaceShipTwo has an empty space, but at a manufacturing plant just down the road technicians on Wednesday were back at work putting together an identical sister ship. The original rocket-powered space plane, built to take paying passengers on short rides into suborbital space, broke apart over Mojave, California, on Friday during a test flight that killed one pilot and left another seriously injured. The cause of the accident is under investigation by the National Transportation Safety Board, which is focusing on why co-pilot Mike Alsbury, who died in the crash, unlocked the ship’s movable tail section early, before aerodynamic forces were right to keep the structure held in place as designed. About two seconds after the tail was unlocked, it began to swivel outward, likely triggering the vehicle’s supersonic breakup and Alsbury’s death. The surviving pilot, Pete Siebold, 43, and Alsbury, 39, had planned to test the so-called feathering tail system as part of SpaceShipTwo’s fourth rocket-powered test flight, the first since Virgin Galactic decided to use a new fuel to boost the space plane to higher altitudes. Virgin Galactic, an offshoot of Richard Branson’s London-based Virgin Group, and manufacturer Scaled Composites had been eager to resume powered test flights after a 10-month hiatus. 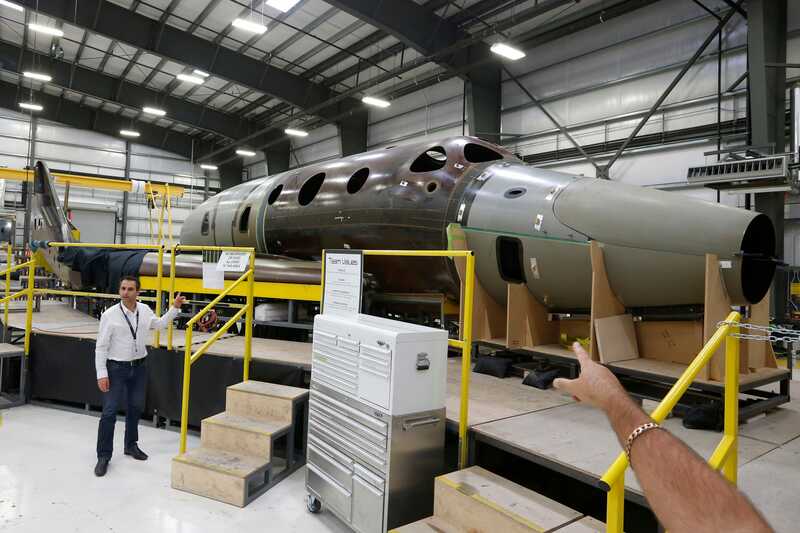 Before the accident, SpaceShipTwo was on track to make its first flight beyond the atmosphere by the end of the year, a key milestone for the planned start of commercial passenger service in 2015. Pivoting the tail section for descent increases the ship’s surface area so that it can safely and effortlessly re-enter Earth’s atmosphere, flying like a badminton shuttlecock. It had been used dozens of times during SpaceShipTwo’s atmospheric test flights, including two rocket-powered flights. As the ship is rocketing upward, the tail is held fast by a large hook that is supposed to remain engaged until the craft reaches supersonic speed, Mike Moses, Virgin Galactic vice president of operations, explained in an interview with Reuters. At that point, the pilots release the hook, though the tail remains pinned back by aerodynamic pressures. The command to actually move the tail into descent position comes after the rocket motor burns out, near the apex of the ship’s altitude. Unlocking the tail is done well before then so that if the mechanism fails, the pilots can abort the flight. Virgin Galactic hopes to complete construction of the second SpaceShipTwo in mid-2015. For now, its official name is 202VG — the second series of the SpaceShipTwo family. Informally, though, employees have taken to calling the new ship “Hope.